(Nanowerk News) NIST researchers have demonstrated the autonomous computer-controlled assembly of atoms into perfect nanostructures using a low temperature scanning tunneling microscope. The results, published in an invited article in the Review of Scientific Instruments ("Autonomous assembly of atomically perfect nanostructures using a scanning tunneling microscope"), show the construction without human intervention of quantum confined two-dimensional nanostructures using single atoms or single molecules on a copper surface. Automated assembly of individual cobalt atoms on an atomically flat copper surface into simple geometric shapes, a square, a triangle, and a circle. From left to right, each figure shows the configuration after each atom move. Image size 15 nm × 15 nm. 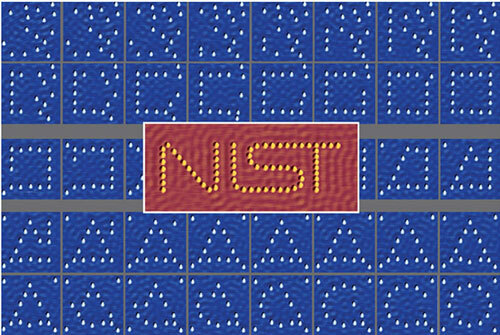 Center: Perfect assembly of the NIST logo after four steps of automated assembly. Image size 40 nm × 17 nm. All images are shown in colored 3D top view with light shadowing with a height range of ∼100 pm. A major goal of nanotechnology is to develop so-called “bottom up” technologies to arrange matter at will by placing atoms exactly where one wants them in order to build nanostructures with specific properties or function. The researchers, led by Robert Celotta and Joseph Stroscio from the CNST, have demonstrated the first steps towards achieving that capability using the atom manipulation mode of a scanning tunneling microscope (STM) in combination with autonomous motion algorithms. The team, which includes Stephen Balakirsky (previously in EL and now at Georgia Tech), Aaron Fein (PML), Frank Hess (previously in the CNST), and Gregory Rutter (previously in the CNST and now at Intel), used autonomous algorithms to manipulate single atoms and molecules, much like the algorithms for “hands-free” car driving. The system works by first scanning the locations of available atoms on the surface. It then specifies the desired coordinates of atoms of a nanostructure, and autonomously calculates and directs the trajectories for the STM probe tip to move all the atoms to their desired locations. The team was able to demonstrate that it could autonomously construct cobalt atoms into nanostructures that confine the quantum properties of the copper’s surface electrons. It then used the STM to measure those properties. In addition to demonstrating the construction of nanostructures made out of atoms, they demonstrated that it was possible to construct nanoscale lattices made of carbon monoxide molecules and to tailor-make interacting quantum dots formed from vacancies in the carbon monoxide lattices. The researchers believe that an approach based on autonomous construction of atoms and molecules using this technique could be the foundation for an easily accessed toolkit for producing tailored quantum states with applications in quantum information processing and nanophotonics.